If the hispanics supposed goal is assimilation, why do you want everyone speaking in spanish and shopping in mercados 10 years from now? It was a joke...but honestly it could happen even while they assimilate. Maybe we could do some assimilation too. Tacos y plantains para todos! Oh yeah it is all my master plan, I am responsible. If Mexico is so great, I am curious as to what he is doing here? It was a joke...but honestly it could happen even while they assimilate. Maybe we could do some assimilation too. They are coming here, not vice versa. The burden is upon them to assimilate, not us. LOL you crack me up on how serious you can be. I grew up in South Florida amongst the Puertorriqueños, at that time there was nobody I knew who wanted PR to be independent of US except the people that lived on PR proper. Mainly because the only Americans that go there are Puertorriqueños. American Tourists bring $, only speak English, most hotels are required to speak English even though it is a Spanish country, San Juan is fluent Spanish. Honestly today with all of the wars and hostility towards hispanics, PR may be seeking more active independence, not sure though. I would suggest that the only opinions that really matter are those Puerto Ricans who live in Puerto Rico. We'll see. Please make no mistake about it - I do not harbour any hostilities towards Latinos, and even got into what became a nasty dispute in another of these threads with a poster who filled up the board with "one guy stories" about "illegals" who drove around in Escolades (sic) and bought lobster dinners with food stamps. I would *never* advocate rounding up the illegals, or denying them health care. I'm game as long as you're cooking. How long 'til dinner? I'm American citizen, speak fluent English with not so fluent Spanish, and I love going to mercados instead of Ralphs or Vons. And Im trying to improve my Spanish, because I love Mexican culture. The country Mexico is great. Too bad the people who run it aren't. That's a legitimate question. We see similar images on a regular basis. 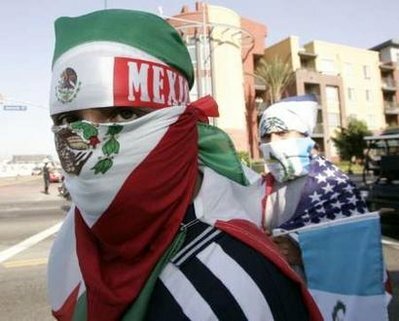 If they soooo love Mexico, and despise the U.S., they need to return there. Also, brave men don't hide their faces; cowards and criminals do. Slig - if this FREE program isn't good enough for you should send her to take a college course and get a REAL teacher! No one is saying it is easy. I took Spanish in college - I know. I am not taking offense, they just need to TRY, it is important they TRY. Are you maybe too close to the situation to have an objective view? BUT the thing about downloading an MP3 illegally or jaywalking it happens once or twice it doesn't require someone to pay for my healthcare, or take care of me while I am in prison for doing this, or driving down wages because I will work dirt cheap OR shall I go on? I think you know the examples. I am NOT perfect but I sure as hell do not put the burden of what I do on others and that is exactly what illegals do when they stay here and mooch! Good for you, but how do you think that guy got back here AFTER he had been DEPORTED???? He didn't just move here he broke the law and snuck back over the border. So ... someone who is illegal is just "physically moving over here?" they do much more than that and you know it!